PalmTan helps you tan your palms by notifying you whenever they fall to their natural downward position and don't face the sun anymore. 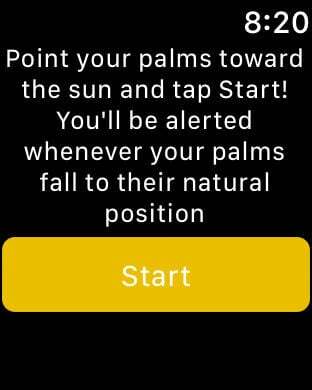 Simply open PalmTan on Apple Watch and orient your palms toward the sun. Then tap Start! You'll be alerted whenever your palms don't face the sun anymore. All of your data is synced with PalmTan on iPhone, where you can view and manage all of your sessions.